Every Sunday is Woolworths Sunday Funday where kids get into the footy for free! Bring the kids down and experience the fun and exciting entertainment of an AFL game with the whole family. 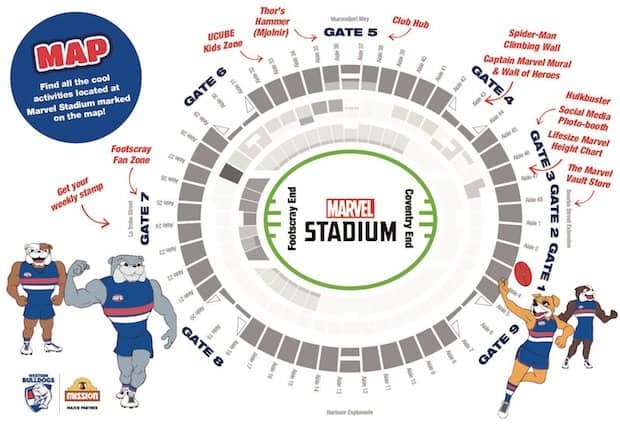 There’s more than just the footy, with free activities at the Bulldogs Fan Zone, UCUBE presented by Woolworths Playground, Mission Foods Bulldogs Stadium Jumping Castle and a great range of Marvel entertainment to keep the kids entertained around the stadium. Free general admission tickets are available to children under the age of 15 and can be purchased in advance, which will be subject to the ticket agent transaction fee or will be available on match day at the box office where no additional fees will be incurred. Join in the fun and entertainment at the Footscray end Fan Zone located inside Gate 7. UCUBE is a free, fun and new way for your kids to experience the footy. The kids zone features a huge variety of sensory play equipment, including slides, ball pits, obstacles, jumping mats, tackle bags, footballs and more. You’ll have the chance to meet AFL players before the game. UCUBE is open to children aged 5-14 years from when gates open until end of half time. Located at Gate 5 on the internal concourse, near aisle 33.